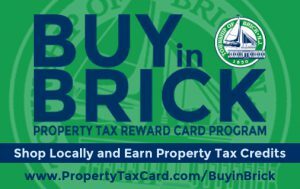 The Buy In Brick Program is simple – use your card and you earn credits towards your property taxes. The first step is GETTING A CARD. Buy In Brick cards are available at Town Hall during work hours. They are free to receive. If you like to get one through the mail, please email us your address. Once you have a card, register it online. Earn credits towards your property taxes. See the total credits you’ve earned on your 3rd Quarter tax bill! If you are a Brick Township business owner and would like to speak to someone about joining Buy In Brick, please call us at 732-451-4007.